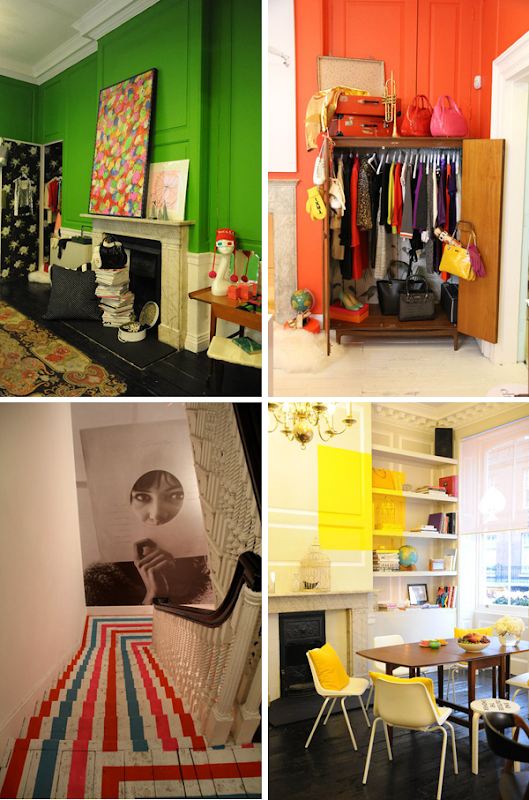 Loving the fun energy of the Kate Spade London Pop-up shop. Any of you Brits checked it out? It is open until November 10th - here are the details. Photos from Kate Spade's facebook where you can see more. love the brightness of it all! Kate Spade is tres chic! Tres cutesy pie! Oh I went and it was fab! They even invited my french bulldog to come and have a look. I think the stripey stairs made her a little bit crazy, or at least that is what I"m blaming for her wild eyes in the pictures from the instore photo booth! It was a really sweet showing of their brand–better than the nyc store! This feels part Wes Anderson to me! Why do I feel the sudden urge to paint strips on stairs?! How brilliant! The bright colors and extreme tones really bring this room to life. I came across your post this morning while browsing interior design blogs and your take on interior décor is exquisite. Could you use window treatments of this bright shade to pop as well? It is true that you must dress your windows appropriately to bring out their true beauty. Thank you for writing and as a special thanks to you and your readers, I would like to offer a 20% off coupon using this code upon checkout: BLG20. loving the color, the stairs of course, and the random yellow paint above the fire place. Feels like a wonderland!